Hopefully May will bring lots of flowers and sunshine into your part of the world. May comes along and we also start thinking of all the "moms" in our lives. Whether it's your own mom, your sister, friend or another special woman in your life who is a "mom" for you....let's celebrate them! I am going to give one of these gorgeous "creativity bags" to my mom for mother's day. She is not a scrapper or stamper but she is always on the go whether it's off to her bible study or showing homes as a realtor. She can put all kinds of literature, her bible, and all kinds of things in this very roomy and pretty bag. It also serves as a great carry-on as we have heard from Jenn Balcer(jbalcer) and Beverly Gerard(texasgrammy). They each got one while they were here in California for StampMania and then used it to put all their things and laptop for a travel carry-on. There are pockets for phone, PDA, computer and magazines. It's meant to be able to carry 12x12 paper and scrapbooks. 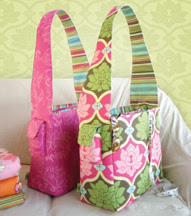 We only have the Sola pattern available right now as the Amy Butler Belle pattern is on back-order. If I know my mom, she will also sew some Prima flowers and other "bling" to make it her own. Check out the Alter This section where you also find lots of fun containers, acrylic paint cans and more that can house fun presents. Mother's Day, graduation, end of school teacher gifts....so many cute containers to alter and put things in. I was thinking that even this dress form would be oh-so-cute if you were to modge podge a bunch of photos of your kids and then give it to grandma for Mother's day. You can use either Ranger Adirondack Paint Dabbers or the Dew Drops to put some color on all these alterables. Did you know that the Ranger Adirondack Alcohol Inks are great on metal tins? 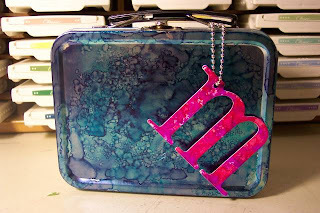 Check out this metal tin that was made by Michelle Fischer(SDiegoGal) using the alcohol inks. We have lots of new tings that came in so give us a couple days to upload them. We have all the new Girl Scout papers, scrapbooks and embellishments. We also received the Boy Scout individual papers and other scrapbook items by K& Co. We will start to carry SEI and also My Mind's Eye. Some of you have the discovered the new Heidi Grace paper lines and we received the embellishments that match. There is even so much more....you'll just have to stay tuned. There are way, too, many new products to talk about.